JustEat Coupons - With Justeat.in coupons, you can now enjoy food items from Kaati Zone at 50% off. You can now order food online with amazing 50% discount through Justeat.in coupons. 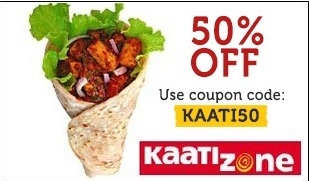 Justeat.in provides Flat 50% off on Kaati Zone items. Kaati Zone is first Indian fast food chain in India. It specialized in Kaati rolls. They have outlets all across the major areas in Bangalore. You can order their Kaati rolls in just few clicks through Just Eat. Also you can enjoy 50% offer with Justeat coupon. Apart from Kaati rolls, they also serve Paratha and Rice combos for quick and healthy bites. They have variety of starters, side dishes, rolls and desserts. How to avail Justeat Coupon offer? 1. Visit Justeat.in offer page here. 2. Select the branch of Kaati Zone. 3. Choose the food items from the menu. 4. Apply Justeat coupon code of 'KAATI50' before buying. 1. This is a limited time offer. 2. Terms and conditions by JustEat and Kaati Zone might be applicable.